(PRESS SEC) — His Excellency Dr. Hamad Bin Abdulaziz Al-Kawari, a Qatari diplomat and statesman, who is also Qatar’s candidate for the post of Director-General of UNESCO, paid a courtesy call on Prime Minister Dr. the Honourable Timothy Harris today, Tuesday, January 10th, 2017, in Basseterre, St. Kitts. In late November 2016 – following Prime Minister Harris’ trip to Manila, Philippines where he received the prestigious Gusi Peace Prize, Asia’s equivalent of the Nobel Peace Prize – Dr. Harris undertook a high-level visit to the Gulf Arab State of Qatar. In Qatar, he met the Qatari Prime Minister, HRH Sheikh Abdullah bin Nasser bin Khalifa Al-Thani, as well as members of the private sector, and H.E. Dr. Hamad Bin Abdulaziz Al-Kawari, who serves as Adviser at the Amiri Diwan government headquarters in Qatar. 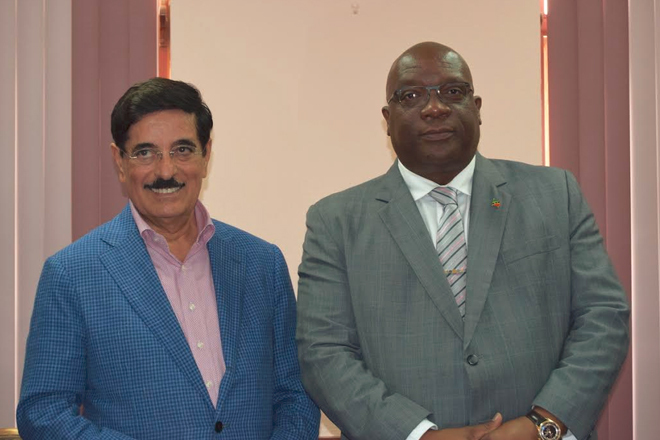 “We are very happy that you have kept your word to visit us, see how we live and learn a bit more first-hand about our country,” Prime Minister Harris told His Excellency Dr. Al-Kawari this afternoon at Government Headquarters. Qatar, which is slightly smaller than the U.S. state of Connecticut, is ranked as the world’s richest country. In 1971, the world’s largest natural gas field was discovered off the coast of Qatar. Today, the country has the world’s largest natural gas reserves after Russia and Iran. Qatar has also diversified its economy in areas such as financial services, real estate investment and education. In 1998, for instance, the Qatari government built Education City, a major campus that supports six American and two European universities, as well as research centres and think tanks. In November 2016, during Prime Minister Harris’ meeting with Qatar’s Prime Minister, the two leaders explored areas of collaboration in economic, education and citizenship investment sectors. Prime Minister Harris also met with the leading Qatari businessman and international iconic hotel property owner, H.E. Sheikh Faisal Bin Qassim Al Thani, in a separate meeting. Prime Minister Dr. the Honourable Timothy Harris was accompanied on his trip to Qatar by His Excellency Dr. David Doyle, the Federation’s Ambassador to UNESCO based in Paris, and Mr. Justin Kareem Hawley, the Federation’s Consul General in Dubai. Present at today’s meeting in Basseterre were Senator and Minister of State within the Ministry of Health, Community Development, Gender Affairs and Social Services, the Honourable Wendy Phipps; Cabinet Secretary, Mrs. Josephine Huggins, Permanent Secretary in the Office of the Prime Minister, Mr. Andrew Skerritt, and Secretary General of the National Commission for UNESCO, Mr. Antonio Maynard.